◎ What is welcoming ceremony for absolute good ancestors? ◎ How to offer the Hyojeong Offering Papers? ◎ What is the Hyojeong Offering Ceremony for the Inheritance of Heavenly Fortune? If you want to know more information, please click here <The Cheon-il Guk Hyojeong Won>. And you can read the e-book. ◎ What is the Spirit World and Physical World Blessing? 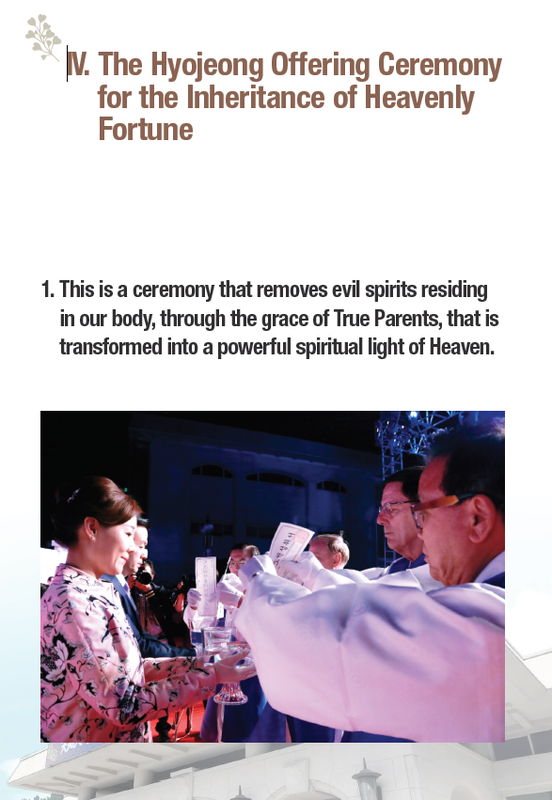 Please click here and click the title '6 Workshops to become a Spirit World and Physical World Blessed Couple' to know more information. ◎ How to become a Spirit World and Physical World Blessed Couple? ◎ Are International Call Cards available in HJ Heaven and Earth CheonBo Training Center? Please ask for International Call Cards at the Korean Office, 1st floor of Cheongseong Wanglim Palace (Heavenly Palace). ◎ Can I buy a holy robe in HJ Heaven and Earth CheonBo Training Center? A holy robe can be purchased in the store of B2 floor of ChenBo Won. ◎ Can we use a FAX machine in HJ Heaven and Earth CheonBo Training Center? A FAX machine is located at the Korean Office, 1st floor of Cheongseong Wanglim Palace (Heavenly Palace). ◎ Where can I apply for Private Lockers? Please ask the Korean Office located on the 1st Floor of Cheonseong Wanglim Palace (Heavenly Palace).